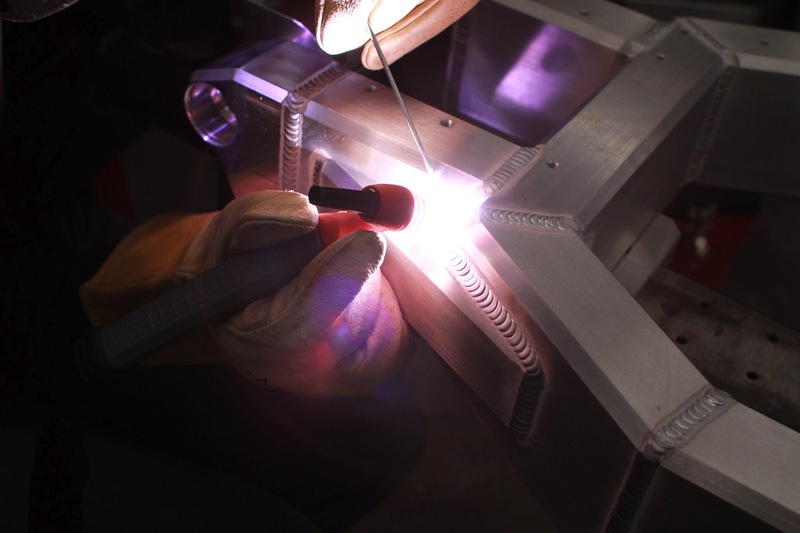 For a while I have been thinking about a welder, as always being on a tight budget I was curious about the many low-priced flux-core wire feed welders that populate the craigslist ads and harbor freight catalogs. I was pretty sure that I would not be happy with the quality of the welds produced as I worked for two years around a welding shop and growing up with a dad who is an ASME certified welder. I know what a good weld looks like. And here is my first weld ever! Yeah right!!! That is some amazing TIG welding done by Josh Coker of Confederate Motors Inc. of course, producing a good weld is something I’ve never had to do. After talking to my Dad about what I wanted to do, it turns out that he had a “Campbell Hausfeld Professional Welders Flux Core 80” welder that he had bought 8 years ago sitting in a closet. These go for around $200 new. He used it for some projects around the house including welding his trailer hitch onto his pickup. My Dad offered to let me borrow it to try it out and see how I liked it which I was psyched up for. This way I could assess how this type of welder performs. I had some parts that I had pulled off Oldbike when I first got it that I figured would be as good a material as any to try out my welding with. What you see in the picture above is an engine crash-guard. It is pretty heavy gauge steel. The part that I wanted to try to weld was the lower mounting tab to the loose part of the same mounting tab. I used some multi-angle magnets to set the two pieces at a 90-degree angle planning to weld into the valley. This is about 1/4” to 3/16” thick, much thicker than the material I will be welding for my project. Here’s a shot of the first two tacks I welded to the pieces. When I took the magnets off the loose portion of the material fell to the ground. Not a very good start! Here is a picture after the first pass it’s just ugly isn’t it!?! It doesn’t get any better with the second pass. Here is the second pass parts of it look better but just not anything close to what I would consider a good weld. None-the-less I decided to test and see how well it held up. Some discoloration on the inside of the two pieces, is that heat penetration? A side shot of the weld, and last but not least you can see a video of me beating on the weld with a hammer to see if it will break below. I will be continuing to practice on different materials and different thicknesses before I even think of touching anything on the actual bike.